If you are the man who has always wanted to be a pirate on the high seas, free to sail the sea while drinking copious amounts of spirits, all while ransacking anything and everything that you please Well, you might be a little out of luck; piracy is frowned upon, nowadays. But the good news is you can look like one! 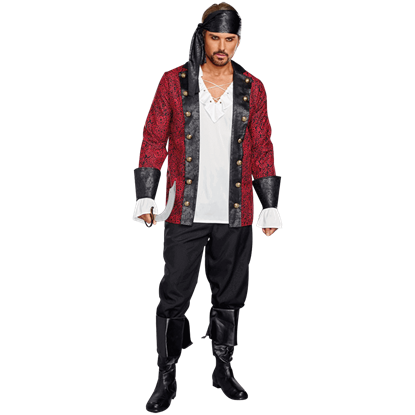 And not only can you look like a darn-good (metaphorically) pirate in one of our mens pirate costumes, but you can look like one virtually any day of the year, because these costumes are great for any pirate party or event! 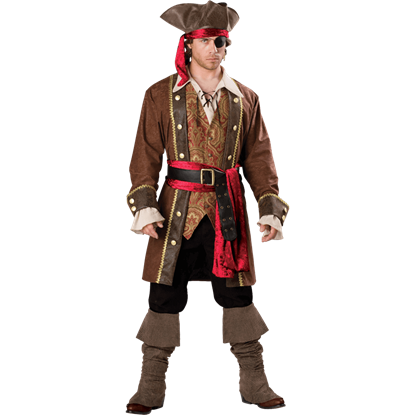 In fact, in one of our mens pirate costumes, you can pretty much do anything you want, just as long as you do not go illegally ransacking anything and keep your spirit consumption well within acceptable norms. Ok, so you will not be a real pirate, but we do offer a great variety of great pirate costumes and pirate costume shirts, ensuring that even if you cannot be a real pirate, you can at least look like the pirate you want to be, whether its a lowly pirate deck-swab, the cut-throat pirate crewmember, or the commanding pirate captain. 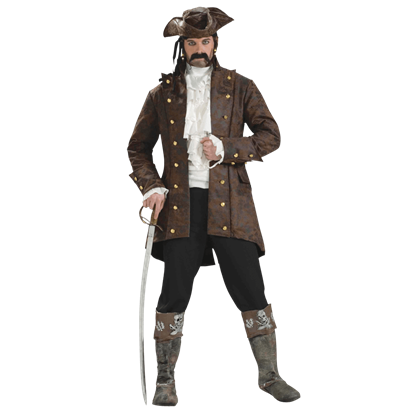 And as long as you look the part in one of our mens pirate costumes, you can certainly feel the part and that is all that really matters. This shirt will give your costume an authentic pirate look. Featuring a ruffled lace up collar and ruffled sleeve cuffs, it is a must for any first mate or swashbuckler. 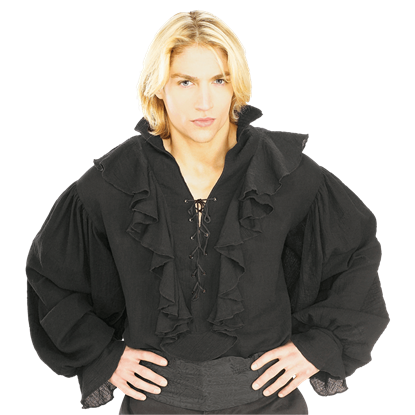 Our Black Pirate Costume Shirt is made from polyester. This shirt will give your costume an authentic pirate look. Featuring a ruffled lace up collar and ruffled sleeve cuffs, it is a must for any first mate or swashbuckler. 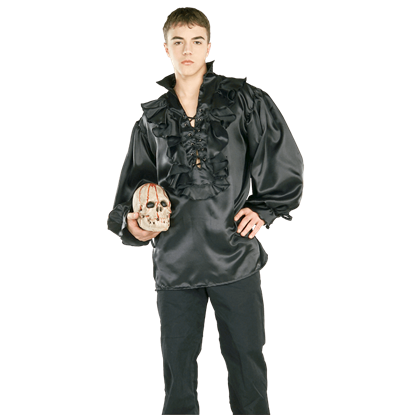 Our Black Satin Pirate Costume Shirt is made from real satin. When the water calls your name, you must be ready to take to the seas by wearing the Buccaneer Baron Costume Shirt! With its classic design and comfortable build, this shirt is the ideal piece to finish off your pirate costume! Do you feel like your pirate costume is just missing something? You have your hat, so what else could be missing? You might be missing a good jacket, in which case this Buccaneers Costume Jacket might be just what you need. Just call me Captain Skullduggery, cause that's what I likes to do! Now walks the plank, before I keelhaul ya, yaaarrrr! 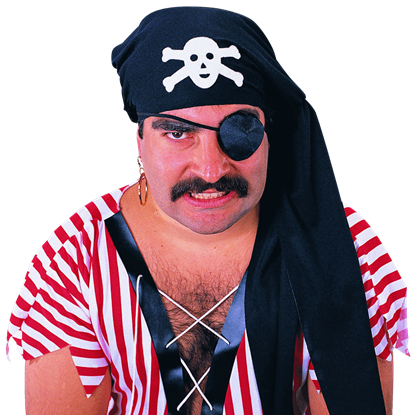 If ye talk mean, if you talk like this, then the Captain Skullduggery Men's Costume is the one for you! Do you long to be a pirate sailing the high seas? 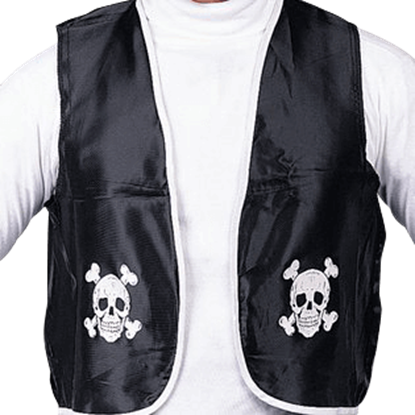 It can all start with the right look, and this Costume Pirate Vest is a great accent that can be worn to enhance the appearance of any pirate look that you might already have. The last raid rewarded our crew with treasures untold. Let us don our finest and celebrate our success on the Seven Seas. The Deluxe Pirate Costume Pack contains a fine assortment of accessories suitable for the worthy buccaneer. Some pirate belts are plain and simple, designed to hold up pants and allow for the attachment of guns, swords, and bags of plunder. 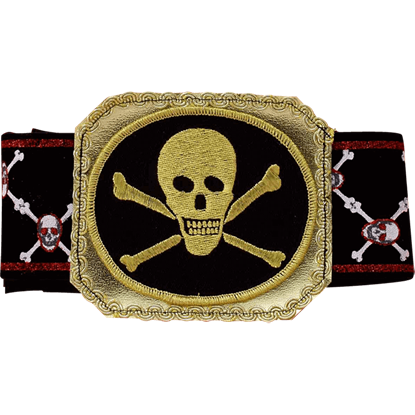 Others, like this Fancy Pirates Belt, are designed to accent a pirates style more than anything. 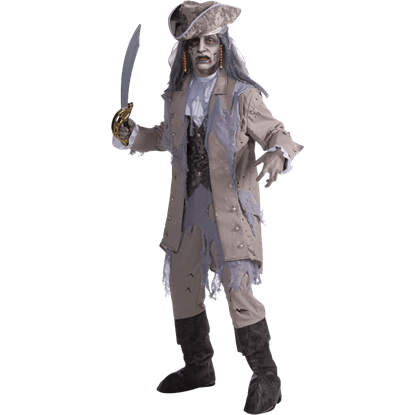 If it has been your dream to sail the high seas, the Ghostly Pirate Costume might be your ticket to an undead existence on a spooky ghost ship. 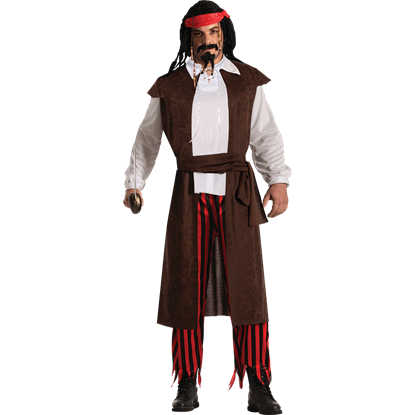 This costume will make you look like a ghostly and ghoulish pirate captain. All hands on deck, fire a shot across their bow! Your crew will follow your orders without question when you dress in this Holy Ship Mens Costume. The rich red jacket pattern contrasts with the black faux leather cuffs and lapel. 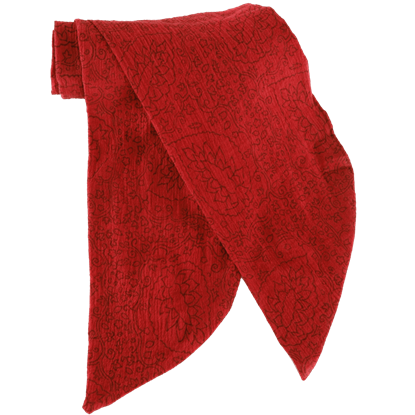 Add extra detail to any pirate look with the officially licensed Jack Sparrow Head Scarf. An incredibly versatile costume accessory, this pirate bandana lends you the style of the fan favorite Pirates of the Caribbean character. 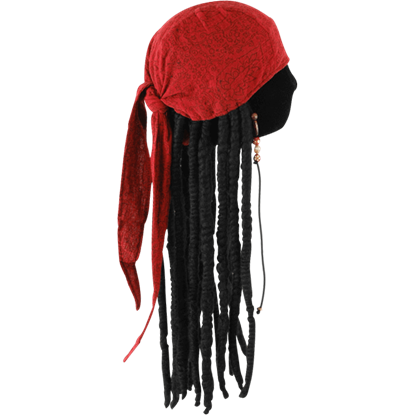 Whether you are trying to complete your appearance as the infamous Captain Jack Sparrow or just trying to look like your own variant of a Caribbean buccaneer, the Jack Sparrow Pirate Scarf with Dreads is a great accessory to use.